Never underestimate the power of the vegan voice. The message of compassion goes a long way, especially when heard in large numbers. Gourmet Burger Kitchen found this out the hard way over the weekend, when complaints came flooding in for their latest ad campaign, forcing them to backtrack and pull the ads after just two days. 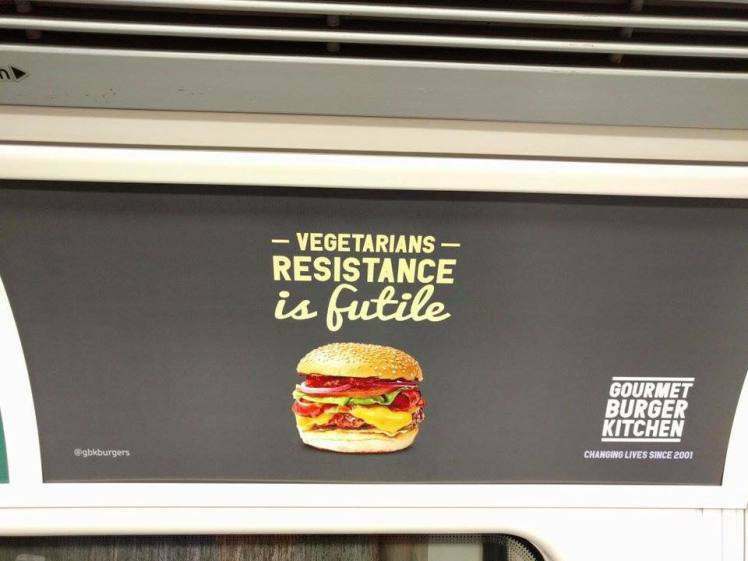 One of GBK’s three ads seen across London showed a picture of a young cow together with the caption: ‘They eat grass so you don’t have to.’ Another read: ‘You always remember the time you gave up being vegetarian’, with a third depicting one of their burgers, with the caption ‘Vegetarians, resistance is futile’. GBK were inundated with complaints, as were the Advertising Standards Agency. The burger chain was accused, among other things, of picking on a minority group. Indeed, they appeared to be as unaware of the legal status of Veganism as a protected belief under equality laws as they were about the size and strength of the vegan community. The campaign backfired tremendously. Thousands upon thousands took to social media to show their outrage. The parody #gourmetmurderkitchen even started trending on Twitter. The extent of the vegan community’s displeasure was covered by some news outlets this morning. GBK responded by confirming that they were taking down the ads and withdrawing the campaign. Jasmijn de Boo, CEO of The Vegan Society, said: “What a wonderful example of the power of the people to change things. They spotted an injustice, and made their voices heard. GBK had no choice but to listen and react. “GBK has shown itself to be totally out of touch. These outdated and highly offensive ads were completely misjudged and smacked of both naivety and ignorance. Were they not aware of the growth of the vegan movement? “If they wanted to bring in new custom to boost a slow January, they ought to have embraced Veganuary rather than alienate a growing section of society and offered some more vegan options. That’s what their competitors, Handmade Burger Co, have done this month with enormous success.